Tadah!!! here are the stuff that I bought from Althea Korea. Psssttt… there are lots of special promotion during their birthday month so go and stock up your k beauty products. Monster Pack Face Lift Pack this is the new item so got promotion and very worth it. 6 pcs of Koelf Ruby Bulgarian Rose Masks for hydration, tips is cheaper to buy in bulk than single piece of mask after all we use mask very regular. Big Marker witch’s pouch skinny brush big marker liner, sorry I am addicted to eye liners. I just can’t get enough of them because I need them everyday. The Seam Healing Tea Garden Green Tea Cleansing Water this is new to me so I would like to try it. Anyway my makeup cleanser finish very fast so it’s ok to buy more. That about it, looks like I’m justifying to myself why I need more skincare. Well, I can’t help it! I am a girl and want to look good. So it’s ok to shop when its affordable and at a great price. Oh ya! here is the summary about all the happenings at Althea Korea Turns 1 celebration. Hurry yoh, everything is while stock last. Birthday Giveaway. Pick 3 Top Sellers for 100% REBATE. - Got your Althea party kit? 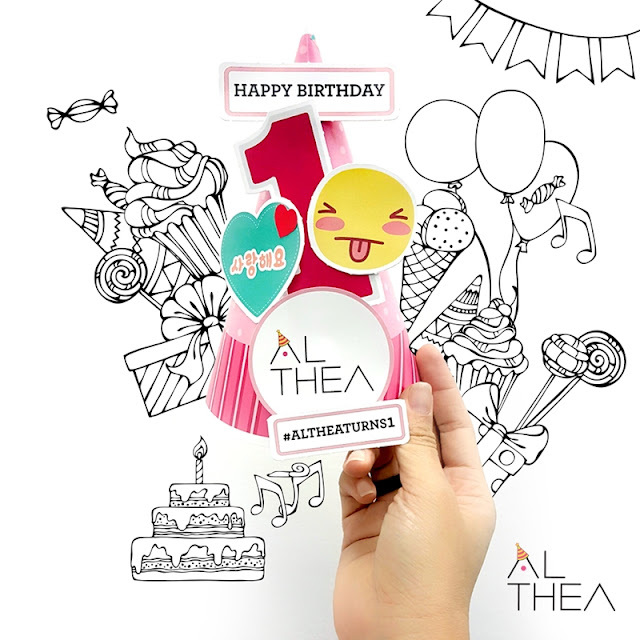 Wish us a happy birthday with #altheaturns1 and stand a chance to win amazing prizes such as Macbook Air, Ipad Air 2, iPhone 6S, Galaxy S6 Edge, Canon EOS M10 Selfie Camera, Althea credits and beauty hampers from Althea! There are prizes total worth KRW10,000,000 to be won. Please take note, contest starts from 20th July - 15th August, 2016. So don’t miss this chance oh.